Looking for a kid’s hooded bath robe or pool/beach cover up? Purchase one of our Sanders Classic Kids children’s hooded robes featuring fun motifs and/or matching towel set for any special occasion. Our robes and towels can be monogrammed with your child’s name. Monogrammed lettering will match the piping color, featuring a simple block font for boys and elegant script lettering for girls. Purchase these super-plush hooded kids robes (made from 12 oz. 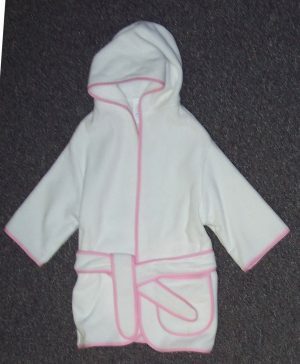 terry velour from Turkey) , including a convenient pocket, for your little girl or boy. These pint-sized robes are perfect for bath time, playing poolside and protecting your child’s skin at the beach. Our adorable cotton terry cover ups are comfortable and soft on your child’s sensitive skin. Enjoy their variety of motifs, such as pink beach toys, animals and sport designs. At Classic Personalized Gifts, we carry customized treasures for family and friends of any age. Your child will be excited to wear this personalized wrap to dry off and stay warm after his or her nighttime bath! OUR CHILDRENS PRODUCTS DO NOT COMPLY WITH FEDERAL FLAMMABILITY REQUIREMENTS SET FOR CHILDRENS SLEEPWEAR. THEY ARE NOT INTENDED TO BE USED AS SLEEPWEAR. THEY SHOULD BE PURCHASED ONLY FOR BEACH, POOL AND BATH USE.